The medal shown at left is awarded to members when they are inducted into the Order of the Beaver. The inductees are listed below, and a number are profiled on the Inductee Profiles page. 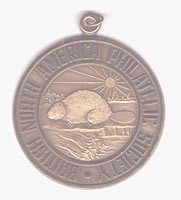 In 1997, the members of the Order initiated the BNAPS Order of the Beaver Lifetime Achievement Award to recognize philatelists who have made significant contributions to BNA philately but who might not meet the criteria for induction into the Order of the Beaver. The philatelists who have received this award along with their achievements are the subject of the Lifetime Achivements Award page. The Order of the Beaver inductees since 1968, when the Fellowship of BNAPS was established, are listed below. An asterisk indicates that the inductee is deceased.